Published 2015, Zoological Journal of the Linnean Society 175: 307-318. Click here for electronic access. Abstract. Bilaterally asymmetrical glochidia (i.e. bivalved parasitic larvae bearing a large marginal appendage on a single valve) have been reported from five Asian freshwater mussel genera belonging to two separate subfamilies, the Gonideinae (i.e. Pseudodon, Solenaia, and Physunio) and Rectidentinae (i.e. Contradens and Trapezoideus). This classification requires that the bilaterally asymmetrical glochidium-bearing mussels are not monophyletic, and suggests that this atypical larval morphology evolved twice in the same geographic region. Although homoplastic glochidium characters are known (e.g. marginal appendages and size), we hypothesized that bilaterally asymmetrical glochidia represent a novel morphological synapomorphy. We tested the monophyly of the mussels bearing bilaterally asymmetrical glochidia using a molecular matrix consisting of representatives from all six freshwater mussel families and three molecular markers (28S, 16S, and COI). Bayesian inference, maximum likelihood, and ancestral state reconstruction were employed to estimate the phylogeny and larval trait transformations. The reconstructed phylogeny rejects the monophyly of the asymmetrical glochidium-bearing mussels and resolves two putative origins of asymmetrical glochidia; however, ancestral state reconstruction supports asymmetrical glochidia as a synapomorphy of only one supraspecific taxon of the Rectidentinae. In the Gonideinae, asymmetrical glochidia were autapomorphic of Pseudodon cambodjensis (Petit, 1865). That is, no other taxa resolved among the Gonideinae had bilaterally asymmetrical glochidia, including other Pseudodon species. We describe how the alleged intrageneric glochidial variation in Pseudodon, and in the other genera of the Gonideinae reported to have asymmetrical glochidia (i.e. Solenaia and Physunio), challenge the resolved convergence of asymmetrical glochidia. Our results are discussed in the context of freshwater mussel larval evolution, patterns in life-history traits, and the classification of freshwater mussels generally. Published 2015, Molecular Phylogenetics & Evolution 85: 1-9. Click here for electronic access. Abstract. The freshwater mussel family Hyriidae (Mollusca: Bivalvia: Unionida) has a disjunct trans-Pacific distribution in Australasia and South America. Previous phylogenetic analyses have estimated the evolutionary relationships of the family and the major infra-familial taxa (Velesunioninae and Hyriinae: Hyridellini in Australia; Hyriinae: Hyriini, Castaliini, and Rhipidodontini in South America), but taxon and character sampling have been too incomplete to support a predictive classification or allow testing of biogeographical hypotheses. We sampled 30 freshwater mussel individuals representing the aforementioned hyriid taxa, as well as outgroup species representing the five other freshwater mussel families and their marine sister group (order Trigoniida). Our ingroup included representatives of all Australian genera. Phylogenetic relationships were estimated from three gene fragments (nuclear 28S, COI and 16S mtDNA) using maximum parsimony, maximum likelihood, and Bayesian inference, and we applied a Bayesian relaxed clock model calibrated with fossil dates to estimate node ages. Our analyses found good support for monophyly of the Hyriidae and the subfamilies and tribes, as well as the paraphyly of the Australasian taxa (Velesunioninae, (Hyridellini, (Rhipidodontini, (Castaliini, Hyriini)))). The Hyriidae was recovered as sister to a clade [composed] of all other Recent freshwater mussel families. Our molecular date estimation supported Cretaceous origins of the major hyriid clades, pre-dating the Tertiary isolation of South America from Antarctica/Australia. We hypothesize that early diversification of the Hyriidae was driven by terrestrial barriers on Gondwana rather than marine barriers following disintegration of the super-continent. Invited presentation at the Second International Meeting on Biology and Conservation of Freshwater Bivalves, 4-8 October 2015, Buffalo, NY. Abstract. 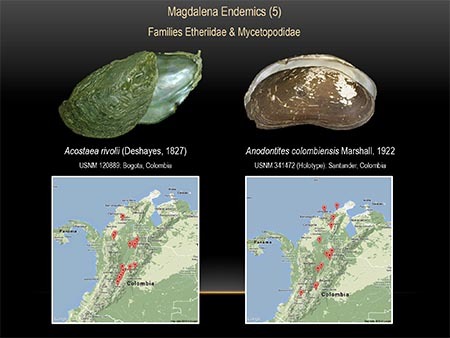 We conducted a systematic re-evaluation of the genera and species of South American freshwater mussels (Bivalvia: Unionoida) based on fieldwork, collections-based research in 23 major collections, and a literature review. 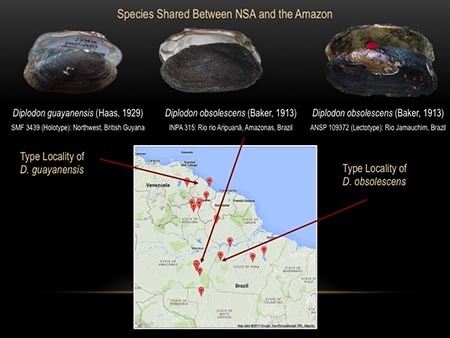 Digital photographs of specimens and geo-referenced localities were integrated into a comprehensive database of freshwater mussel taxonomy, literature records, and museum specimens. To-date, we have captured data on over 8300 lots from South America. These data are publicly available via the MUSSEL Project Web Site (http://www.mussel-project.net/). The continent is inhabited by three families of freshwater mussels: Etheriidae, Hyriidae, and Mycetopodidae. We currently recognize approximately 130 species in 20 genera, all but 4 of which are endemic. We divided the continent into 5 regions corresponding to major drainages: 1. Northern South America (including the Magdalena, Orinoco and other tributaries to the Carribean); 2. Amazon (including the Tocantins); 3. Rio de la Plata; 4. São Francisco and Atlantic tributaries; and 5. Pacific drainages. The most speciose region is the Rio de la Plata with 64 species and 21 endemics followed by the Rio São Francisco and Atlantic tribs. (40 species, 8 endemics), Amazon basin (43 species, 21 endemics), Northern South America (36 species, 22 endemics) and the Pacific drainages with 3 species (1 endemic?). The freshwater mussel fauna of South America is poorly understood, particularly the basins outside of the Rio de la Plata and Atlantic drainages. We will present our results on patterns of species richness and taxonomic diversity in the Amazon basin and summarize the known deficiencies in our understanding of the biogeography and evolution of these taxa. This slide shows the distributions of two species in the Magdalena Basin, Colombia. Presented at the 81st annual meeting of the American Malacological Society, 28-31 August 2015, University of Michigan Biological Station, Pellston, MI. Abstract. The fresh waters of Wisconsin are biogeographically significant because 1) the state straddles the divide between the Mississippi and Great Lakes/St. Lawrence basins, and 2) much of the state was only recently colonized following ablation of late Pleistocene glaciers. Current disjunctions of freshwater mussels among basins are strong evidence for past confluence, and this student-driven study set out to describe the distributions of mussel species in the state in that context. 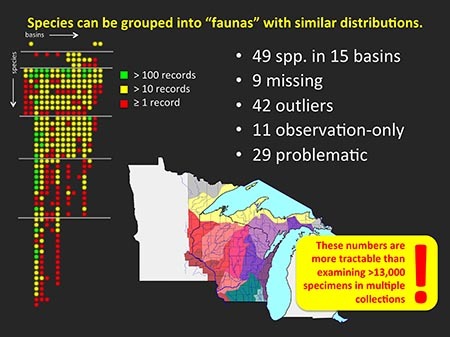 Species distributions were determined from a literature review as well as analysis of 8600 Wisconsin species-locality records from 6 databases of museum specimens and observations. Each species-locality record was georeferenced to river drainage and county or township (when possible). At least 49 species have been reported from Wisconsin, although there is evidence for more. The counties of greatest species richness are those along the western border of the state, adjacent to the Mississippi, St. Croix, and Wisconsin rivers. Six overlapping faunal assemblages were identified: 1) 7 or 8 species are known from all major basins including Lake Superior; 2) 9 or 10 species are known from all major basins except Lake Superior; 3) 1 species is known only from Lake Superior; 4) 3 species are known from only from eastern Wisconsin in tributaries of Lake Michigan and the Rock-Fox (Illinois); 5) 12 species are known from the Mississippi basin and the Fox (Lake Michigan); and 6) the remaining 16 species are restricted to the western part of the state in the Mississippi Basin. Species assemblages are indicative of the chronology of post-glacial colonization. Moreover, the species patterns uncovered in this study are hypothesized to be indicative of patterns of gene flow within species. This slide shows the summary of distribution patterns in the Wisconsin region. Presented at the 53rd Annual Meeting of the American Fisheries Society – Illinois Chapter, Pere Marquette State Park, 3-5 March 2015. Also presented at the 9th Biennial Freshwater Mollusk Conservation Society Symposium, St. Charles, Missouri, 22-26 March 2015. Abstract.The Amazon basin of South America is inhabited by three families of freshwater mussels: Etheriidae, Hyriidae, and Mycetopodidae. We conducted a systematic re-evaluation of the species and genera of the drainage based on fieldwork, collections-based research in 17 major research collections, and a comprehensive literature review. Digital photographs of specimen lots and geo-referenced localities were integrated into a comprehensive database of freshwater mussel taxonomy, literature records, and museum specimens. To-date, we have captured over 8200 specimen lots from South America, including 1640 from the Amazon basin. These data are publicly available via the MUSSEL Project Web Site (http://www.mussel-project.net/). We currently recognize approximately 56 species in 15 genera in the Amazon basin, 16 of which are endemic. Three to four species are shared between northern South America and the Amazon through connections between the Orinoco and Amazon though the Casiquiare Canal and the Essequibo and Amazon via the upper Rio Branco. From 2012-2014 we conducted surveys of the rio Xingu, the second largest tributary to the Amazon. Twelve species are now known from the basin, including three that have not previously been reported. We will present our results on patterns of species richness and taxonomic diversity in the Amazon basin and summarize the known deficiencies in our understanding of the biogeography and evolution of these taxa. This slide shows the type localities of some Diplodon from northern South America.